Today I'm going to answer a few questions from you wonderful ladies. First, Renee, asked me if I have a favorite project. Two things popped in my mind. First is this "Junk" bag. It was a fun pattern and incorporated one of my favorite things - vintage hankies. 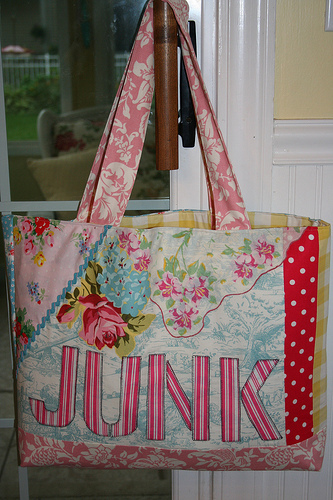 The pattern is called "The Junk Bag" by Jackie Clark. The second favorite is this quilt. I love vintage kitchen embroidery and Lecien fabric. The marriage of the two makes for one happy quilter. I did not have a pattern for this quilt. I used embroidery transfer patterns I had. I have always loved the cake stand block and enjoyed putting those together. My current hand quilting project is the quilt I made using Trish's tutorial. I pieced the top over the weekend. In answer to the hand quilting questions, I really don't like using a hoop but find it necessary for large quilts in maneuvering the fabric or small quilts if I'm using cotton thread. For example, this is a crib size quilt. I am using hand quilting cotton thread which disappears into the fabric. For me to see my stitches I need to use the hoop. When I'm using size 8 perle cotton to stitch, the thread is much thicker and easier to see. For some reason it's harder for me to use a hoop with perle cotton so I don't. Either way, I have to make sure that I have a lot of pins to keep the back from puckering. The use of the hoop keeps the fabric smoother. When making my t-shirt quilts, I use Pellon fusible featherweight interfacing. The lighter the better so if you ladies know of anything lighter than featherweight, please let me know. T-shirt quilts can be heavy enough so you don't want to use a thick and weighty interfacing. I'm testing out a new rotary cutter (new to me). It's made by Dritz and I will let you know what I think. I would also love to know from you if your rulers ever wear out? I think I might have a nick in mine as I feel a catch when I cut strips. Any thoughts? Happy Monday! Your Junking bag is adorable and I really like the use of the vintage hankies. I have so many hankies from my Auntie that I am not sure what to do with them all, too pretty to give away, but also too pretty to store away. Absolutely cannot wait to see your newest finish, love all the fabrics and the pattern! I would love to try the ruler that sharpens your blade each time you use it. Have you tried one of those before? Your creations are as precious as always!! Thank you for sharing your favorites! I, too, love incorporating hankies in projects. You fabric and color combinations are a delight. I so appreciate you uplifting blog. I am blessed each time I visit! ps. I was wondering if you do any orders on the side? How much would you charge for something like the quilt your working on now? :) They're all so pretty! I love that bag and that quilt. 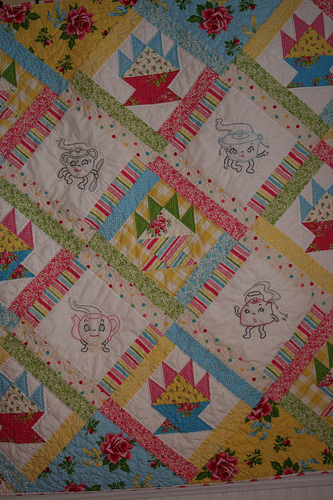 I made a quilt for my daughter from patterns from Annie's Attic embroidered on pastel squares. I love those kitchen embroideries. I have a book of redwork-just haven't done anything in it yet. I have some old hankies that belonged to my grandmother. I use that same fusible interfacing on my t-shirt quilts and very much like the outcome. Have not heard of anything lighter weight but will watch your site if anyone posts different info. I love your quilt with the kitchen embroidery blocks! It's always fun to check out your blog. Your choice of colors whether for decorating or quilting are always fun. And your Pinterest pins are always terrific, too. I have a ruler that I accidentally knocked off the table and now the corner chip is a bit jagged. I also think your cutting mat wears out as well. Great blog post! 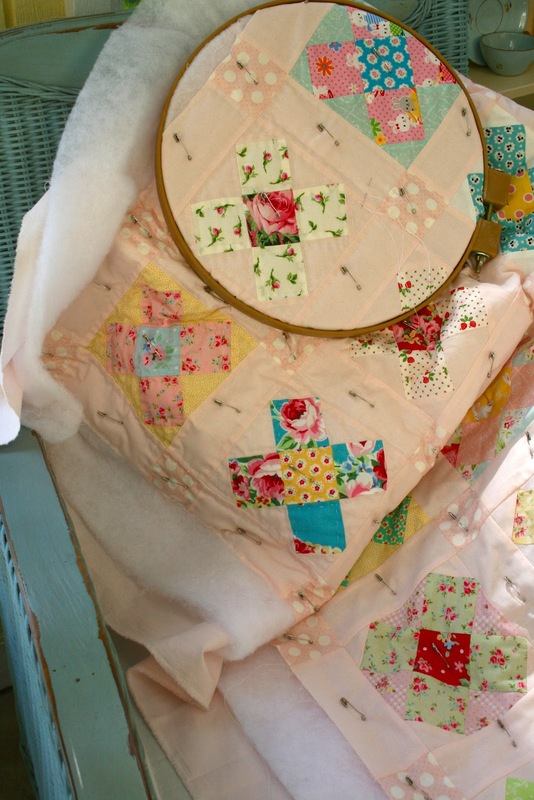 I love your stitchery quilt and enjoyed seeing your hand quilting photos and reading your tips.